When building the Giant Scrabble Board for Paul’s Place we only used half of the plywood and Zintec that we bought, so why not build a second game. 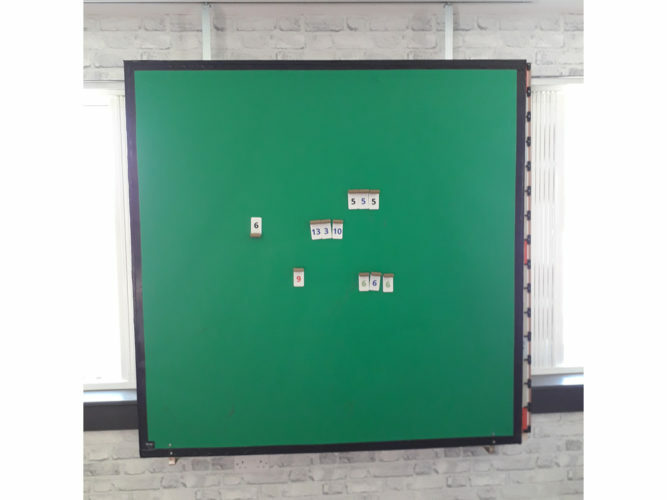 The members were keen on Rummikub, a game played on a plain playing area and a set of 106 tiles comprising two sets of four colours with the numbers 1 to 13 plus a joker. The board was to be co-located with the Scrabble Board. We built a 1.5m x 1.5m sandwich board of the 20mm plywood, a 1mm Zintec sheet and a green vinyl overlay provided once again by Rage Displays, just around the corner from the day centre. A 3m long ceiling track was purchased and screwed through the ceiling into the wooden rafters of the building, the corresponding bogies were fixed to vertical angle steel that was in turn bolted to the plywood (before the sandwich construction was made). 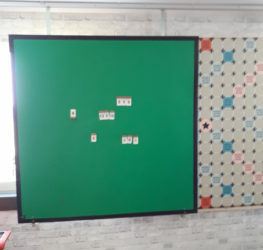 Wheels were added on brackets at the bottom of the board so that they ran against the wall and provided a stand off from the Scrabble Board. When the Scrabble Board is in use, the Rummikub Board can be slid out of the way. The tiles are 75mm high and 40mm wide, they were 3D printed on a Prusa Mk3 printer. 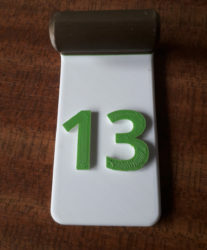 Like the Scrabble Board, the base thickness as 4mm and the handle has the same profile. The tiles were printed in Pearl White instead of the plain white used on the Scrabble Board (I just think that it looks slightly better for the tiles). So that the colour of the tile could not be seen by an opponent, the handles were all printed in a Bronze colour. This necessitated two filament colour changes, the middle colour (black, red, blue, green) was only 0.6mm (3 layers) high, most of the raised number was in the Pearl White to make up a total of 2mm. This reduced the chance of an opponent seeing the number colour. An explanation: The printer can only print one colour and therefore it has to be paused and the existing colour filament unloaded and a new colour loaded. Now, everything will be printed in that colour until it is changed again. 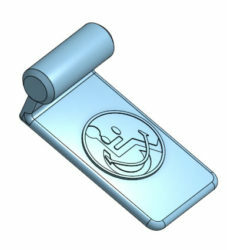 A thin tile colour can be seen in the handle section. This has added a second game to the Giant Games Compendium which is accessible by all of the day centre members. But … seeing that we have two games …. what about more!